The milestone has been reached along with the completion of major aircraft development tests. According to a Lockheed Martin media release, the F-35 Lightning II fighter aircraft fleet recently exceeded 100,000 flight hours. It is definitely a great achievement for the US manufacturer, considering that it has recently achieved many other important goals in the System Development and Demonstration (SDD) phase. - Completed testing for the F-35A's final envelope involving high risk 'edge of the envelope' maneuvers, stressing the aircraft to its limits in structural strength, vehicle systems performance, and aerodynamics while proving excellent handling qualities. - Completed all U.K. 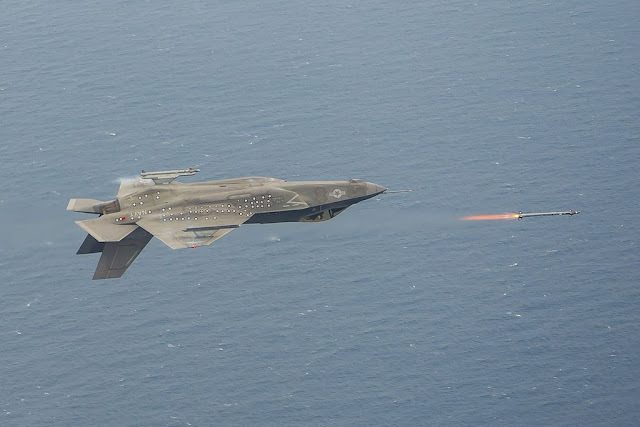 Weapon Delivery Accuracy tests for the AIM-132 ASRAAM and Paveway IV weapons, and completed 45 of 50 SDD Weapon Delivery Accuracy tests including multiple target and multiple shot engagements as well as internal gun and centerline external pod 25mm gun accuracy tests. - Performed multi-ship mission effectiveness tests, such as Offensive Counter-Air and Maritime Interdiction, demonstrating the performance of the F-35 System. The remaining development flight testing includes validating the final release of 3F software, F-35B ski jump testing, F-35B austere site operations, high-Mach Loads testing for both the F-35B and F-35C and completion of the remaining weapons delivery accuracy tests. The release of 3F software is an important step to allow the aircraft to emplow weapons from external pylons (More details here). "This 100K milestone marks a significant level of maturity for the program and the F-35 weapons system," said Lockheed Martin Executive Vice President and F-35 Program General Manager Jeff Babione. "We are well positioned to complete air vehicle full 3F and mission systems software development by the end of 2017."